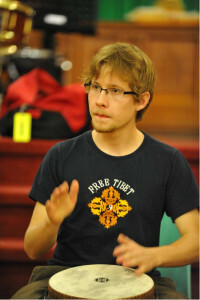 In 2008, Derek founded the Hand Drumming in the Schools program in which he voluntarily travels to schools in the greater Toronto area and facilitates hand-drumming workshops for students of all ages. He also works as a drum circle facilitator with Soul Drums. In the summer of 2009, Derek travelled to Ghana to study traditional West African hand drumming, and over the course of two months, completed an Ethnomusicology course at University of Ghana. He also studied West African percussion with master drummers Kwasi Dunyo and Ledzi Agudzemegah in Dagbamete, a village in the Volta Region. Over the past few years, Derek has received a number of awards, including Humber College’s President’s Medal for leadership, the Garfield Weston National Level Scholarship for leadership, the SABIAN Cymbals Award + Scholarship, the George McCrae Award for musical excellence, and the Principal’s Award for Student Leadership. In the spring of 2011, Derek was selected to participate in the Betty Carter Jazz Ahead residency in Washington, DC. Working alongside talented young musicians/composers from around the world, this two-week long program culminated in performances on the Millenium Stage at the Kennedy Centre. Derek has studied privately with Steve Mancuso, Doug Sole, Dan Weiss, Jonathan Blake, Nate Smith and Larnell Lewis. He has had the opportunity to play in ensembles lead by Pat Labarbera, Brian Dickenson, Alex Dean, Ravi Naimpally, Waleed Abdulhamid, and Luis Mario Ochoa.